These rolls are a lot of work to make, but well worth it. One of the things I'm making for Thanksgiving (more recipes to follow). Stir together yeast, warm water, and honey in a large bowl and let stand until foamy, about 5 minutes. (If mixture doesn't foam, start over with new yeast.) Melt butter in small dish and set aside. Mix flour, salt, buttermilk, and 6 Tbsp melted butter into yeast mixture with a wooden spoon or rubber spatula until a soft dough forms. Turn out dough onto a well-floured surface and knead, dusting surface and your hands with just enough flour to keep dough from sticking, until dough is elastic and smooth, 6 to 8 minutes. Form dough into a ball. Put dough in an greased large bowl (I use the butter wrapper) and turn to coat. Cover bowl with plastic wrap and a kitchen towel and let dough rise in a draft-free place at warm room temperature until doubled, 1 1/2 to 2 hours. Punch down dough (do not knead), then halve. Roll out half of dough on a lightly floured surface with a floured rolling pin (about 1/8 inch thick; keep remaining half covered with plastic wrap). Brush dough with butter and cut into 6 equal strips. Stack strips, buttered sides up, and cut crosswise into 6 equal pieces. Turn each piece on a side and put into one of the cups in a muffin pan. Make more rolls with remaining dough in same manner. Separate outer layers of each roll to fan outward. Cover rolls with a kitchen towel (not terry cloth) and let rise in a draft-free place at warm room temperature until doubled and dough fills cups, 1 to 1 1/2 hours. Preheat oven to 375°F. 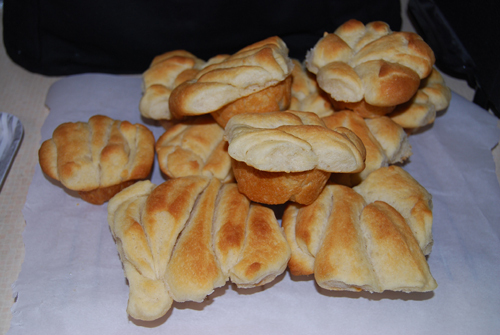 Bake rolls until golden brown, 20 to 25 minutes. Brush tops with remaining butter, then transfer rolls to a rack and cool at least 20 minutes. Yum. Added to recipe file.